The embroidery machine can be programmed to do everything from designs to lettering. Today's embroidery machines don't just do embroidery. 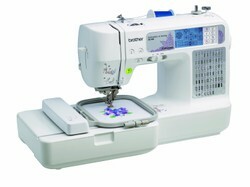 They can also be a combination sewing and embroidery machine although there are machines that just do embroidery. Brother has a number of both. What makes these machines special is that they are computerized and have a digital screen that either have built in designs or the ability for you to download designs from your computer using designs you've made or you can download them from the internet. According to Brother's website, beginners will see how easy it is to learn using their embroidery machines while seasoned sewers will feel empowered by their creative tools. Prices vary for a good quality machine but you can pay as little as $300 up to several thousands. Embroidery has been popular for hundreds of years. In the good old days it was considered part of a woman's training to be able to embroider. It was an art and girls started early with a sampler. Some of these samplers can be found in antique stores and depending on the age and condition can cost a good sum of money! Today we have embroidery machines that make the job easier and because they can be programmed with digital images, they are more versatile. Some of the designs can be very intricate and complex. You just program the machine and sit back and watch it do its job! The embroidery machine can be programmed to do everything from designs to lettering. Just enter the design in the machine, adjust it to fit the size of the material being used and the computer automatically transfers that design with thread to the material. An embroidery machine looks very similar to a sewing machine, however they a programmed for all types of embroidery. These machines have built in computers with dozens of designs or you can download software and programs and add them to the machine to make even more designs. They have a needle and bobbin just like a regular sewing machine. There are two types of machines: single needle and multi-needle. With a single needle machine, the needle is stationary and the embroidery arm moves around the material according to the design chosen. With a multi-needle machine there is anywhere from four to ten needles. Each needle has its own color so you can do much more intricate designs with this type of machine. As well they have more hoop sizes to choose from and they speed of the machine is also much faster. If you only want to do a little bit of embroidery then you will only need the single needle machine. However, if you are an active hobbyist or want to start a home business, you should check out the multi-needle machines. Keep your machine well-maintained. It is a good idea to clean it and get it serviced from time to time. Make sure you use the appropriate stabilizer for the material and thread you are using. Always do some test stitching before you start the actual embroidery. As well as the right stabilizer you will want to make sure that you have the right size of embroidery hoop before you start the job. If you are working with denser patterns, make sure you go slower with the machine. That way it won't get stuck. Make sure you cut or tear the stabilizer carefully when removing it from the design so it doesn't get damaged. Always press the finished product from the back. This will set the stitches and you will be happy with the finished item. With a little practice you will be able to have your embroidery machine perform all sorts of great designs. Embroidery machines can open up a whole new world of crafting. Instead of hand-stitching names or patterns on fabrics, you can let an embroidery machine do all the work. Not only can they save you time and effort but with the choice of hundreds of patterns you can be as creative as you want. There is of course a bit of a learning curve when it comes to these machines. 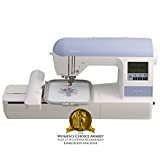 Most come with very good manuals and there are always videos on YouTube that can explain some of the finer points of using an embroidery machine. In order to make the design you will need to select stabilizer or backing material. This will help to keep the pattern in place and not have the material slip around as the machine does the stitching. There are many types of stabilizers available including ones that can be cut-away, torn-away, washed-away, heat-away and they can be fusible or have self-adhesive features. As well different materials will need their own type of stabilizer. Your machine's manual should be able to help you with this information or when you buy fabric ask the store clerk. You will also need to decide whether or not to use a hoop. If you use a self-adhesive stabilizer or strategic pinning you have the option to hoop the stabilizer rather than the actual fabric. This means that the hoop frame and tension are applied primarily to the stabilizer. This works well with stretchy fabrics. Needle selection is important as they come in various sizes and styles. Choose a needle that is relative to the density and characteristics of the fabric. Check the manufacture's recommendations when choosing a needle. With so many patterns to choose, starting out can be a bit of a challenge. You might want to practice with using the machine's embroidery pattern. You might want to do a little practicing first before you take on a big job so you know how the machine reacts. Repurpose those old jeans into functional crafts! Use the denim to sew up some projects -- aprons, totebags, book covers, or drawstring bags.